Ukraine's Minister of Internal Affairs Yuri Lutsenko says he disposes of information about the people, who have taken part in the poisoning of the President Viktor Yushchenko. "It is has been established already who has carried the poison through the border, which MP has escorted it, which employee has brought it to the site of the crime, and who has put the poison in the President's meal", Lutsenko said in an interview for the British "Times", RIA Novosti reported Friday. At the beginning of December 2004 doctors at Vienna's Rudolfinerhaus clinic said Ukraine's opposition leader has been poisoned in an assassination attempt during election campaigning. 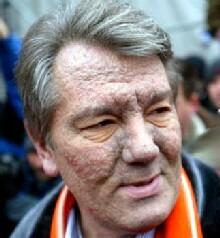 The poisoning left Yushchenko's appearance disfigured almost beyond recognition within five months.